Have you thought about doing a detox or are trying to find the motivation to do another one? Are you wondering why doing a detox is important and how to start and stick with it? 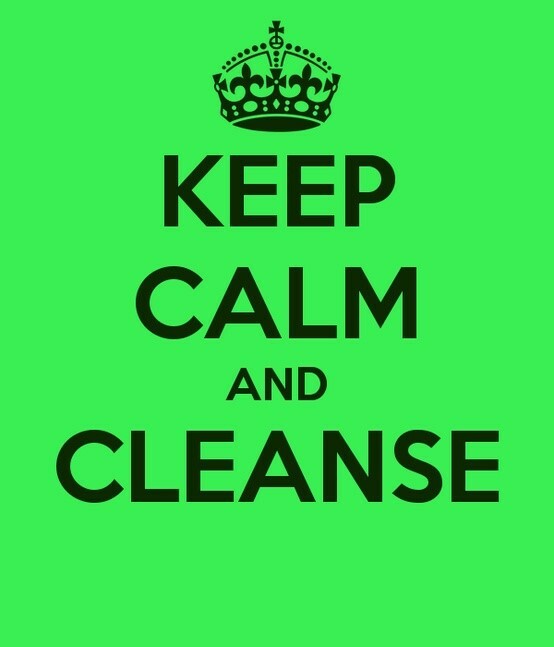 In keeping with living a more intentional life, my Mantra for the past 21 days has been….Keep Calm and Cleanse. January has become the month for me to reboot my mind and body. Exposed to chemicals in the air we breathe, the products we lather on our bodies, food additives and preservatives, herbicides, pesticides and chemicals added to the water we drink, our bodies get out of balance. When toxins build up in the body you may experience tiredness, headaches and digestive and neurological symptoms. A well-designed cleanse enhances the functions of the detoxification organs and help us regain balance of our hormones, digestion and nutrition. Detoxifying the body will reset your taste buds and will help with common cravings of caffeine, alcohol, salty, sweet, fatty or unhealthy foods. [Click to Tweet] Not only will you feel better but you may even shed a few unwanted pounds! I personally needed to reboot my mind and body and get back on track with my health and my workout routine. For a more detailed explanation of The Why, click here to watch Dr. Keith Ungar’s video explanation. As a Patient Care Coordinator at Functional Endocrinology of Ohio, it has been extremely important to me to keep up a healthy lifestyle for not only myself and my family but for our patients. I’ve walked and continue to walk the walk so that I am able to connect with our patients and the lifestyle changes that they will need to make. At Functional Endocrinology of Ohio, Dr. Keith Ungar recommends Apex Energetics Clearvite detox program. The ClearVite progam is a cleansing regimen to support health and vitality. Within the first 2 weeks I notice positive changes in my body, energy levels, mood and mental clarity. Along with detoxing I have incorporated a new workout routine to get back on track. I feel it is very important to have a consistent workout routine as well. Being ready is key to a successful cleanse! [Click to Tweet] It’s important that you understand the cleanse and to know the haves and the have-nots. It’s crucial that you prepare a shopping list and also a weekly menu. 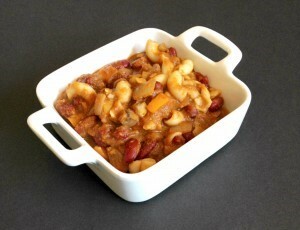 Pinterest is an awesome resource for gluten, dairy and soy free recipes. Being prepared will lead to a calm and successful cleanse. Below is my Detox Diary. Also be sure to check out my Food Tracking Sheets for the 21 days and some of my favorite recipes. Excited to reap the benefits, I am continuing to prepare for each day and keep up with my workout regimen. 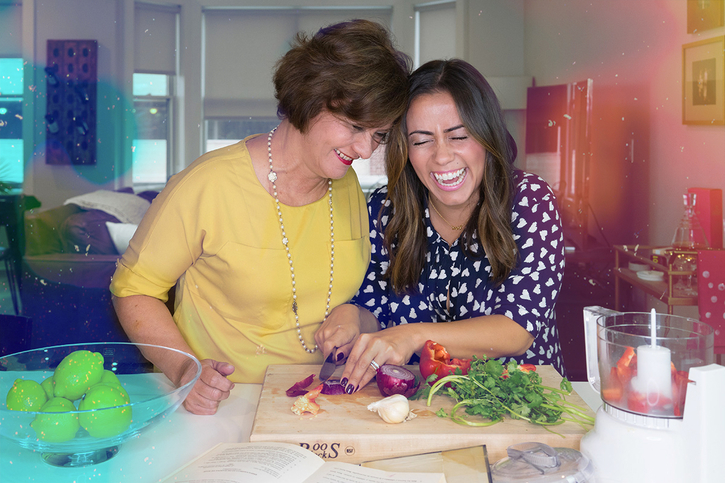 I have incorporated my cleanse recipes into my family’s daily menu and have encouraged those around me to get moving. I’m determined to avoid the curse of “Cabin Fever!” I’m feeling stronger and more confident that I am doing what is most important for me, my body, my family and my patients. I am sleeping well and waking refreshed! This is, for most, the most challenging phase of the detox. The 8th day begins a “No Meat Week” and just the thought of it gives me anxiety! But I chose to embrace the process and put a little effort in to it. The Sunday before, I searched Pinterest for recipes conducive to the Clearvite cleanse, went to my local fresh produce market and invited a friend over to share in the fun of cooking! My mantra this week has been to give 100% to all that I do and of course, make the most of all that I do. Being prepared for this week is a must. Make sure to have plenty of healthy snack items on hand. I found myself eating something every couple of hours throughout the day. I recommend mixing up a batch of Polly’s Paleo Granola. See recipe below. So happy to add meat back into the menu. I rely heavily on meat as a source of protein. But I must say throughout the no meat week I did feel pretty good! Feeling confident, accomplished, energized, and back on track. These last few days will be a breeze! Stir this well and quickly pour over the granola mix. Stir together very well. Spread out on 2 baking sheets. Bake at 250 degrees for 30 to 45 minutes or until lightly browned. Stir every 10 minutes and watch carefully. Let cool, then stir in 1 lb. craisins , raisins or dried cherries. Store in an air tight container in the refrigerator. Eat as a snack or serve as cereal with Almond or coconut milk. Thanks Polly!! *add a dash of Cheyenne pepper to spice it up a bit! When you are ready for a healthy lifestyle, it is a lot easier to maintain good habits throughout the year! Do you have a favorite detox recipe? 4 Ingredients You Do Not Want In Your Toothpaste! 1824 there was a dentist named Peabody that came up with the idea to put soap in his paste to clean his teeth. Before that, people were trying to come up with all kinds of ways to clean their teeth. Then, in 1854, a man named John Harris started adding chalk to his paste. In 1874, Colgate stepped on the scene, putting toothpaste in jars, which eventually evolved into tube toothpaste based on a product called Crème Dentifrice. Flouride was added in the 1960’s. So what’s in our toothpaste now? Many name-brand toothpastes that are on the shelf have ingredients that studies have shown connected to cancer, blindness, and death. The main ingredient is sodium fluoride, some toothpastes have enough fluoride to kill a small child in hours. If you grab your tube of toothpaste, there is a warning label saying “Keep out of reach of children under six years of age” and also, “If more than used for brushing is accidentally swallowed, get medical help or contact a Poison Control Center right away.” That is what my Colgate tube says. Dentists have told us that fluoride prevents cavities, but that is the only positive effect and it is outweighed by the negative. Sodium fluoride is the main ingredient in toothpaste and rat poison. Sodium fluoride is also found in anesthetic drugs, psychiatric drugs, and has never been approved by the FDA. The next ingredient is sodium lauryl sulfate, the foaming that makes you think your teeth are really getting clean when really it’s the same ingredient foams engine cleaners and garage floor cleansers. There are dyes as well FD&C blue no. 1 and yellow no.10. Finally, triclosan is a known pesticide. FD&C blue dye No. 2. This dye is in many toothpastes, but the Center for Science in the Public Interest warns against it as it might be related to learning and behavioral issues, severe allergic reactions and other health problems. Sodium lauryl sulfate. The American College of Toxicology says it can cause skin corrosion, irritation and canker sores. In lab rats, the ingredient led to depression, diarrhea and death. Triclosan. The anti-microbial ingredient is a pesticide and is an ingredient in OTC toothpaste and hand soap. The Environmental Protection Agency demanded more research be conducted because of triclosan’s negative effects on thyroid and estrogen levels. 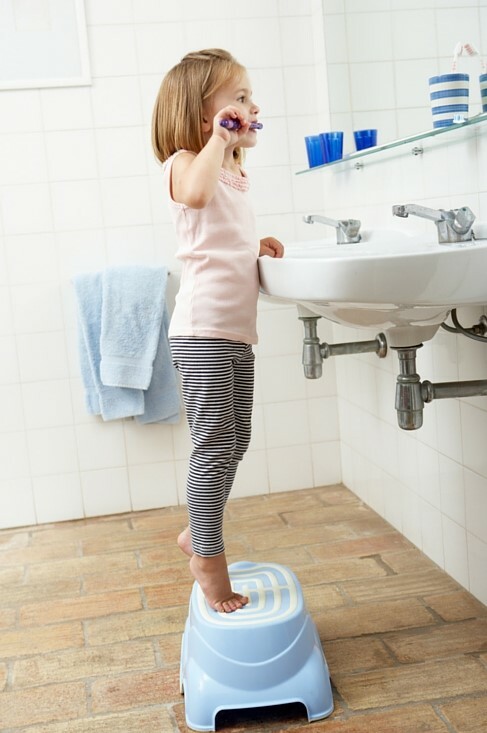 As we brush our teeth, we are not supposed to swallow the toothpaste, but these chemicals enter our system nonetheless every time we brush our teeth through our mucus lining, tissue, and as it trickles down the esophagus. It is generally a good practice to read all labels on anything going in our mouth and on our skin, which both can absorb things and get into our bloodstream. So, if you don’t want to use toothpaste with these ingredients, try coconut oil or baking sodas. There are also many natural toothpastes: Green People’s Spearmint and Aloe, Jack n Jill Organic Banana toothpaste, Lavera toothpaste, Aloe Dent triple action and Tom’s of Maine toothpaste. 5 Ways To Physically and Intellectually Engage With What is On Your Dinner Table. Most people say don’t ever discuss politics or religion as they can lead to heated debates at the dinner table. I say don’t discuss food because it is just as volatile a subject as politics and religion. One of the number one questions patients ask me when they are being healthier is “Doctor what should I be eating for the best diet? ?” That is a loaded question that needs a full book to answer. Obviously, you need to test your body for different food sensitivities to find out what foods aregood or bad for you. We use food sensitivity testing in our office to help answer some of those questions for the patients we treat. We do pre and post testing to see how patients respond to the recommendations we make and most often those treated in our clinic gain a better report card on their follow-up testing. This tells me we are making positive impacts on a patient’s health. The testing offers a scientific approach to a healthier you, but what if there was no science??? What would you do if you didn’t have a test to tell you what foods are good for you…?? Eating food and obtaining food is something we take for granted in the United States. Most of us spend almost no time at all thinking about from where the foods we eat come. This can create disconnect from a variety of topics related to the foods we eat. I feel this disconnect is one reason our society is fatter and sicker than it ever has been in all of history!! Before the times of going to your local Giant Eagle and picking up your food for the day, you had to either grow, hunt, or collect your own foods. The activities surrounding collecting and preparing food brought hidden benefits that one cannot get by going to their local market. We should all take part in actively collecting our foods one way or another to see what goes into the process and hopefully be a healthier you. Below is a list of common things you could do at home or in your area to stimulate the process. 5 Ways to Make Your Commute More Productive and Even Fun! Drive Your Way to A Great Day! Is the worst part of your day driving to and from work? Do you feel like it is a big waste of time? Do you have road rage or are you anxious by the time you get to work or home? Whether you drive to work or take public transportation, the commute time is fun and even enjoyable with these tips. I feel that I’ve spent a good part of my life in my car driving to and from work and to and from appointments. I used to truly hate it but I’ve figured out a way to make it fun and productive. In fact, there are times, when I get home and sit in my car for a few extra minutes in the garage “finishing” up my commute activity. Audiobooks. They are not just for old people or students. In this day and age, every author makes an audio version of his or her book. Everything is available from best-selling fiction, to self-help, to biographies to educational titles. And, you can get a lot of it for free from your local library in CD or electronic format. In my case, I use Audible. It is Amazon’s audio book division. Simply download the Audible app to your cell phone, tablet or computer, register with Audible, pick your book and voilà! It will appear in your audio library in the Audible app for downloading to your device when you are ready. Audible allows you to buy a book or you can subscribe. The subscription option allows you to buy 1, 2, or 3 credits per month to use to purchase a book. Each credit is 1 book. The credits are less expensive than the price of the book so you save some money by subscribing. You can cancel at any time. If you are not sure what to order, just go to Audible’s store on your device or at Audible.com or go to Amazon and search for a book. Your Amazon and Audible accounts link so that whatever you buy will be available in your digital library on both sites.Audio books allow me to “read” the books that I don’t have the time to read while I’m commuting. Besides making the commute actually enjoyable, it saves me time! How many activities do that? Simply connect your phone to the bluetooth in your car and your book will play right through your car speakers and will even pause if you get a phone call. Remember, do not wear headphones when you are driving! Catching up with Friends and Family. I don’t know about you, but I often feel that I’m out sync with some of my friends and family. They are busy and so am I. Calling them during both of our commutes is a way to reconnect and save time! Create a weekly “phone date” with your siblings or children during your mutual commutes. [Click to Tweet] Again, if you do this through bluetooth, both hands will be on the wheel! Making To-Do or Shopping Lists. I have a never-ending “to do” list. I use an app called Evernote (but there are lots of others) that allow me to simply add things to my to-do or shopping lists by speaking the command. This way, by the time I get to the store, my list is in my Evernote app on my phone and I’m ready to shop. Or, my to-do list is current so that I don’t need to sit down and do it when I get home. Think. Part of my daily routine is to think through my day and consider events that did not go as well as I would have liked and those that went perfectly. I do this so that I can think about how I personally handled each of these events and develop a plan to either change the way I acted or decided that in all future similar events that I would act the same. The car is the perfect time to do that. I actually talk to myself out loud to affirm my intentions. When i get home, then any negativity is gone and I am with my family without the burden of those events hanging over my head. Jam Out to The Perfect Playlist. We all listen to music in our cars but we are subject to the playlists of either terrestrial radio or satellite unless we create some personalized playlists. Apple Music and Amazon Prime both allow you to download lots of music for a small monthly subscription fee. You can then play it through your car speakers from your smart phone or tablet. My favorite thing to do is think about a band or musician I used to listen to in high school or college, download greatest hits or album from that artist and sing all the way home! This is guarantee to bring back lots of memories. I bet you can’t wait to get in your car now! I would love to hear any tips or suggestions you have for the daily commute! 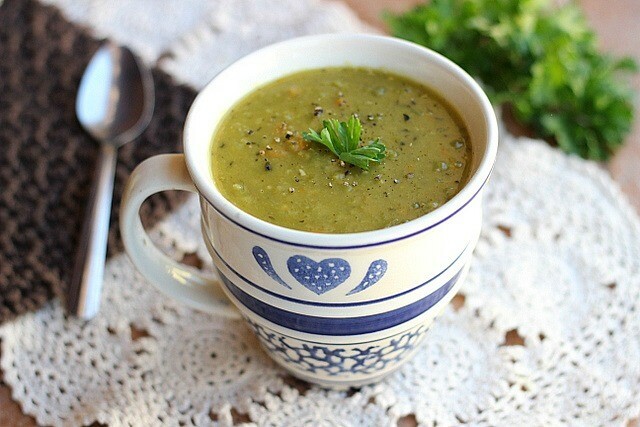 Warm Up With the 5 Best Meatless Soups! Well it is that time of year again. January starts our new year, and what better way to start the new year than with a detox. Detoxes help you get rid of old unwanted waste and inflammation, while repairing your body with nourishing supplements, food, and vitamins. Part of the Clearvite detox we use at our clinic requires a “no-meat-week,” which means you cannot consumer any animal products that whole week. This can sometimes be challenging for those who rely heavily on meat. 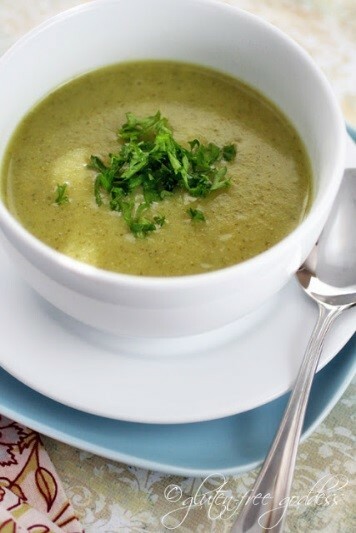 In this blog you will find some hardy soup recipes to get you through the week. No-meat-week is usually a breeze for me since I mostly eat vegetables. However, I understand that not everyone eats like this. I wanted to share some of the recipes I have found helpful and are detox friendly. I hope this will serve those who need it as a good source and maybe ease some of the worry associated with what to eat without meat! 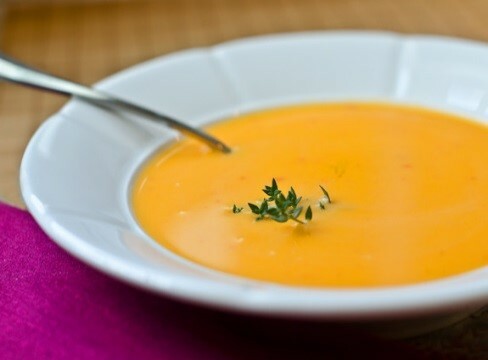 Karina’s Easy Carrot Soup Recipe – Dairy-free and Vegan 1. 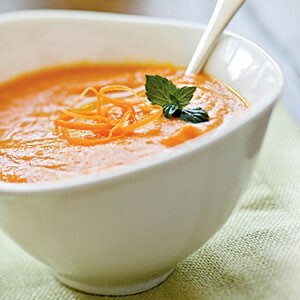 Toss the chopped carrots into a soup pot and add just enough cold water to cover them. Season with sea salt and a dash or two of curry or cumin. Cover and bring to a boil; lower the heat and simmer until the carrots are very tender, about 20 minutes. Add a bit more water, if needed. Puree the soup with a blender until the carrots and the soup is silky smooth. Add the apple juice or creamy beverage and stir well; gently heat it through. Serves 4. Karina’s Kicked Up Coconut Split Pea Soup Recipe 2. Place the split peas in a rice cooker and cover with boiling water. Turn the cooker on low. If you are using a heavy soup pot on the stove, cover the pot, turn the burner on at the lowest setting. Hot soak the peas for one hour. Drain. Place the soaked peas back into the rice cooker or heavy bottomed soup pot and add the chopped garlic, broth, curry, Old Bay Seasoning, and red pepper flakes. Bring the mixture to a simmer and cook until the liquid is reduced and the peas are so tender they break apart with a wooden spoon – about an hour. If you’d rather cook this soup on the stove top, place the soaked peas, garlic, broth, curry, Old Bay Seasoning and red pepper flakes in a soup pot and bring to a gentle simmer; cook until the liquid is reduced a bit and the peas are soft about an hour. *Optional garnishes: chopped fresh cilantro, chopped jalapeños. Heat the olive oil in a soup pot, over medium heat. Add the onion, celery and curry powder; stir and cook until the onion softens. Add the squash and broth. Cover the pot and bring to a simmer. Simmer until the squash is very soft and fork tender – maybe 30 minutes. Add a bit more water if you need to keep the squash from sticking to the pot. Puree the soup with an immersion blender till smooth. Stir in the maple syrup and coconut milk. Season with sea salt and pepper, to taste. Warm through gently and serve. Serves 4. 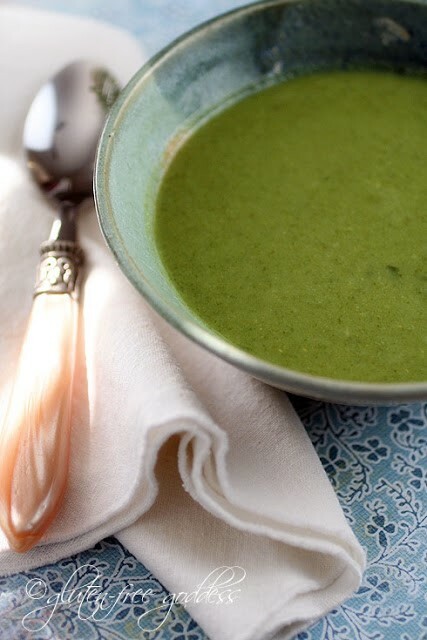 Karina’s Creamy Detox Soup Recipe with Coconut Milk 3. Heat the olive oil in a large soup pot set over medium heat and stir in the garlic, onion, and ginger (this seasons the oil). Add in the broccoli and greens. Add just enough water to cover the vegetables – not too much. You can always thin the soup later, if you need to. Bring to a high simmer. Cover the pot, and reduce the heat to a medium simmer. Cook until the broccoli and greens are tender – maybe 15 minutes or so. Add the chopped parsley, cilantro and mint. Season with sea salt and fresh pepper, to taste. Remove the pot from the heat. Use an immersion blender to purée the soup. Return the pot to the stove and add in the coconut milk. Stir and heat through gently (don’t boil the pureed soup). Taste test and adjust seasonings. Serve with a sprinkle of fresh herbs. Serves 4. Heat a large pot over medium flame. Add 1 tbsp. olive oil, pepper, zucchini, squash, onions, garlic. Cook 5 minutes. Add beans and spices. Stir to combine. Add broth. Bring to a simmer. Lower heat, cover, and cook for about 20 minutes. Add lemon juice, lemon zest, and cilantro. (*add GF pasta or rice) Stir to combine. Heat throughout. Serves 5. Happy New Year’s everyone! Let’s join together in leading a happier, healthier lifestyle in 2016! Cooking From the Heart – You Can Taste the Difference! There is nothing better than food you can feeeeeel. You know what I mean. I’m not talking about the physical feel of the food sliding down your throat or burning the roof of your mouth. It’s the feeling you get when you eat food made with love. It’s the feeling you get when your able to share a meal made with love with people you love. Anything done with passion is just better – gardening, singing, cultivating relationships, living healthy, doctoring and, of course, cooking. [Click to Tweet] Even if cooking is not your favorite thing, here are some ideas on how to incorporate a little bit of love in every meal. Good for the heart (physically and emotionally) and great on the palate! 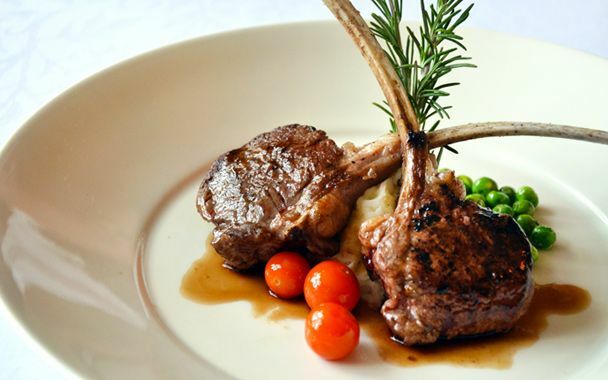 Find a recipe that meets your food specifications, put together a shopping list, and shop. As for the shopping, do what I do – imagine that you are in a little market in Italy with all the time in the world to buy the best ingredients. Be choosy, smile and feel victorious when you find the perfect ingredient – piece of meat, vegetable, spice, etc. 2. Turn cooking time into Your time. Turn on your favorite music, podcast or audio book. Get the lighting just right (bright, dim, or somewhere between). Put on comfortable clothing. Pour yourself a glass of wine, water or other beverage of choice. If you are listening to music – sing along with it! Remember the dwarf motto: “whistle while you work.” Ignore your phone, tablet, and laptop and immerse yourself. 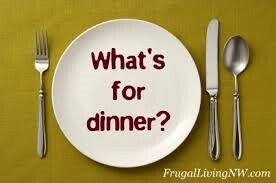 Think about where on what you will serve each part of your meal? All on one plate? Salad bowls? Bread plates? Think about how it will look on the plate. Use your creativity. Take pictures of the plates you particularly love! You may find that your family may want to help when they see how much fun you are having. Let them! 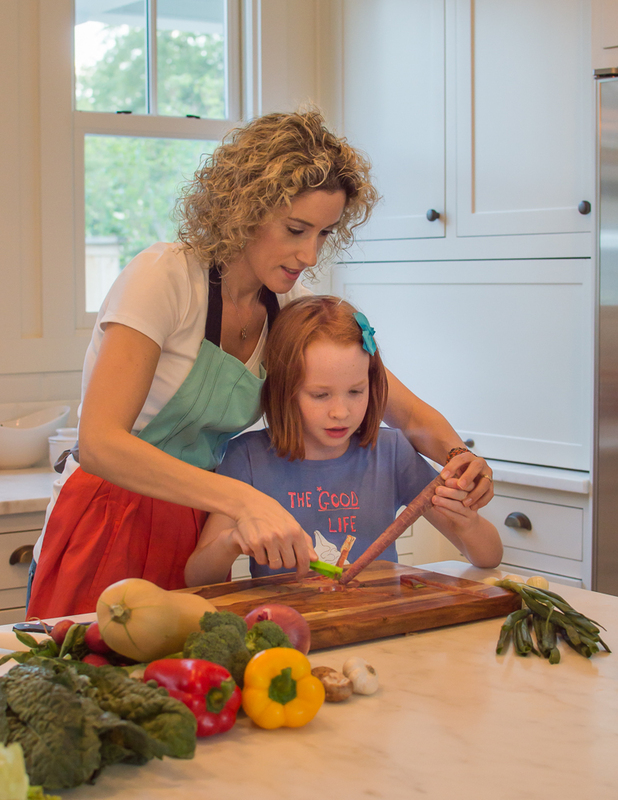 The time spent cooking together could turn into some great family time. 5. Envision the smiles on the faces of the people who will be feeling your love with every bite. There is nothing better than seeing the expression of appreciation on your loved one’s faces as they taste their first bite. You did that! Even if you have a less than expressive family member, they will still feel the love that went into every bite and know how you feel about them. So get in the kitchen. See if you can’t convince yourself to love – or at least, not loathe your time there. And, remember, he/she who cooks does not have to clean up! I’ll be waiting for my invitation to dinner! I would love to hear your cooking from the heart story. January 1st Is The First Page Of a 365 Page Book. Write A Good One! Start the year out with a positive page! To all of my Family, Friends, Clients and loyal Readers I wish you well in the New Year! I wish you all a fresh start. You have 365 new days, 365 new chances. I wish you a productive road ahead along with good health, happiness and joy. Feel the start of something new! Start the year 2016 with gumption. [Click to Tweet] I hope you have learned enough from years past to give to the years to come. I urge you to take some time to sit down and make a plan for the year(s) to come. Take time to think about what is important to you and what will help you achieve an extraordinary life and bring out the best in you. Develop a goal driven, passion driven plan. Make small daily goals that will lead to your bigger goals. Start each day with intention and focus on accomplishing your goals step by step, day by day. Most importantly, BELIEVE in yourself! If you don’t believe you can accomplish your goals, you probably won’t. Consider what is most important to you. What are your priorities? Think about where you want to be in the next year and the next 5 years. What would you like to accomplish? What would you like to cross off your bucket list? Start with a few specific, realistic and attainable goals. Break them down if need be. If you are trying to save for that dream vacation think about a realistic amount to set aside each pay or month. Setting unattainable goals will only set you up for failure so it is very important to be realistic. Write down your goals and keep them in a place that you will see them often. The more you see your goals the more motivating they will become. Do something every day to work towards meeting your long-term goals even if it is just daydreaming. Take time at the end of each month to review your goals. Take pride in those that have been crossed off your list. Finally, never, ever give up! If you don’t do very well the first time around, tomorrow is a new day, a new chance to begin again. You can always start a new chapter. As for me, I continue to strive to live an intentional life. I will start this year by writing down my goals. I personally need something to motivate me, to give me purpose and to help me keep focused on throughout the New Year. I will also take it easy on myself, knowing that sometimes I will achieve my goals and sometimes I won’t. But I am a firm believer in setting goals and having an action plan. Without a plan I will not know where to begin my story. I hope by next year that you surprise yourself by all that you accomplish. I hope you set a goal that makes you want to jump out of bed each morning. This year is yours. 2016 is your chance to write your story! 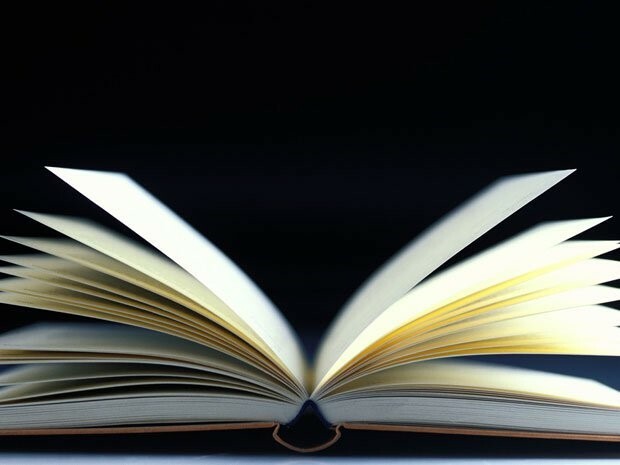 “6 Must-Read Business Books to Accomplish Success – Small Biz Triage.”Small Biz Triage. N.p., 26 Jan. 2015. Web. 23 Dec. 2015. Detoxifying Your Body is Critical to Good Health! 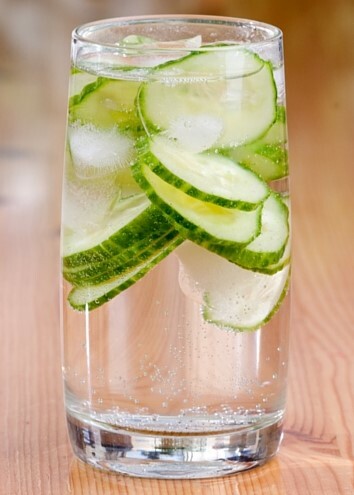 Start the New Year Off Right – Detox So You Can Retox! At this time of year, almost everyone has eating healthy or losing weight as a New Year’s Resolution. Did you know that a good detoxification program is a great way to start! Here are a few of Dr. Ungar’s videos explaining why detoxifying your body is so important and what you should consider when deciding what detoxification program to use. If you would like to try the detox that Dr. Ungar recommends, give us a call at one of the numbers below or email us at info@feohio.com. We have special pricing through the end of January !